Pods can be "tagged" with one or more labels, which can then be used to select and manage groups of pods in a single operation. The labels are stored in key/value format in the metadata hash. One label in this example is docker-registry=default. Pods must have a unique name within their namespace. A pod definition may specify the basis of a name with the generateName attribute, and random characters will be added automatically to generate a unique name. containers specifies an array of container definitions; in this case (as with most), just one. Environment variables can be specified to pass necessary values to each container. Each container in the pod is instantiated from its own Docker-formatted container image. The container can bind to ports which will be made available on the pod’s IP. OpenShift Dedicated defines a security context for containers which specifies whether they are allowed to run as privileged containers, run as a user of their choice, and more. The default context is very restrictive but administrators can modify this as needed. The container specifies where external storage volumes should be mounted within the container. In this case, there is a volume for storing the registry’s data, and one for access to credentials the registry needs for making requests against the OpenShift Dedicated API. The pod restart policy with possible values Always, OnFailure, and Never. The default value is Always. Pods making requests against the OpenShift Dedicated API is a common enough pattern that there is a serviceAccount field for specifying which service account user the pod should authenticate as when making the requests. This enables fine-grained access control for custom infrastructure components. The pod defines storage volumes that are available to its container(s) to use. In this case, it provides an ephemeral volume for the registry storage and a secret volume containing the service account credentials. The service name docker-registry is also used to construct an environment variable with the service IP that is inserted into other pods in the same namespace. The maximum name length is 63 characters. The label selector identifies all pods with the docker-registry=default label attached as its backing pods. Virtual IP of the service, allocated automatically at creation from a pool of internal IPs. Port the service listens on. Port on the backing pods to which the service forwards connections. Name of the headless service. Setting clusterIP variable to None declares a headless service. Selects all pods that have frontend label. OpenShift Dedicated leverages Kubernetes by creating Docker-formatted containers from build images and pushing them to a container image registry. For more information on how OpenShift Dedicated leverages Docker for builds, see the upstream documentation. The Pipeline build strategy allows developers to define a Jenkins pipeline for execution by the Jenkins pipeline plugin. The build can be started, monitored, and managed by OpenShift Dedicated in the same way as any other build type. The first time a project defines a build configuration using a Pipeline strategy, OpenShift Dedicated instantiates a Jenkins server to execute the pipeline. Subsequent Pipeline build configurations in the project share this Jenkins server. An image stream and its associated tags provide an abstraction for referencing container images from within OpenShift Dedicated. The image stream and its tags allow you to see what images are available and ensure that you are using the specific image you need even if the image in the repository changes. 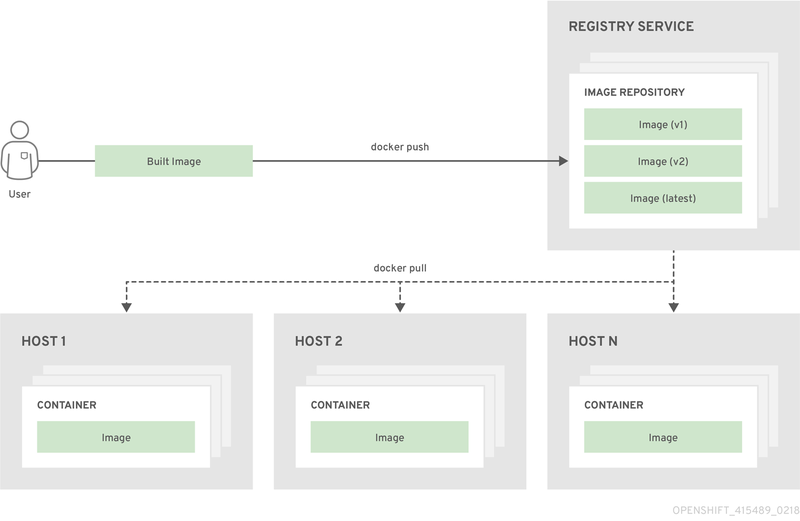 When you define an object that references an image stream tag (such as a Build or Deployment configuration), you point to an image stream tag, not the Docker repository. When you Build or Deploy your application, OpenShift Dedicated queries the Docker repository using the image stream tag to locate the associated ID of the image and uses that exact image. You can trigger Builds and Deployments when a new image is pushed to the registry. Also, OpenShift Dedicated has generic triggers for other resources (such as Kubernetes objects). An OpenShift Dedicated object that contains pointers to any number of Docker-formatted container images identified by tags. You can think of an image stream as equivalent to a Docker repository. The name of the image stream. Docker repository path where new images can be pushed to add/update them in this image stream. The SHA identifier that this image stream tag currently references. Resources that reference this image stream tag use this identifier. The SHA identifier that this image stream tag previously referenced. Can be used to rollback to an older image. The image stream tag name. Image stream image objects are automatically created in OpenShift Dedicated whenever you import or tag an image into the image stream. You should never have to explicitly define an image stream image object in any image stream definition that you use to create image streams. For example, the latest image stream tags that ship with OpenShift Dedicated are tracking tags. This means consumers of the latest image stream tag will be updated to the newest level of the framework provided by the image when a new level becomes available. A latest image stream tag to v3.10 could be changed to v3.11 at any time. It is important to be aware that these latest image stream tags behave differently than the Docker latest tag. The latest image stream tag, in this case, does not point to the latest image in the Docker repository. It points to another image stream tag, which might not be the latest version of an image. For example, if the latest image stream tag points to v3.10 of an image, when the 3.11 version is released, the latest tag is not automatically updated to v3.11, and remains at v3.10 until it is manually updated to point to a v3.11 image stream tag. If the imageChangeParams.automatic field is set to false, the trigger is disabled. When the integrated registry receives a new image, it creates and sends an image stream mapping to OpenShift Dedicated, providing the image’s project, name, tag, and image metadata. This information is used to create a new image (if it does not already exist) and to tag the image into the image stream. OpenShift Dedicated stores complete metadata about each image, such as commands, entry point, and environment variables. Images in OpenShift Dedicated are immutable and the maximum name length is 63 characters. This command causes OpenShift Dedicated to periodically update this particular image stream tag. This period is a cluster-wide setting set to 15 minutes by default. A label query over a set of resources. The result of matchLabels and matchExpressions are logically conjoined. Equality-based selector to specify resources with labels that match the selector. Set-based selector to filter keys. This selects all resources with key equal to tier and value equal to frontend. A template describes a set of objects that can be parameterized and processed to produce a list of objects for creation by OpenShift Dedicated. The objects to create can include anything that users have permission to create within a project, for example services, build configurations, and deployment configurations. A template may also define a set of labels to apply to every object defined in the template.